Seasoning obtained IGP according to a strictly disciplinary (Protected Geographical Indication) using only cooked must and wine vinegar but without the use of caramel or other products of manipulation. NB: The box "gift" completes the cylindrical container requires a contribution of 2 Euro. Balsamic vinegar of Modena "Harmony" : This proposal is obtained from die head IGP, Protected Geographical Indication, is the result of a blend of grape must cooked by adding wine vinegar, all aged in barrels of different Woods to give those flavors that can guarantee the origins of indigenous craftsmanship. A rich brown colour and smell sweet and sour dressing gently persistent, slightly Woody aftertaste and delicate acetic full. Lends itself well to use it on grilled vegetables, about omelets, on the meat or the fish when cooked, but also to accompany, diversifying, a plate of cheeses and seasoned. You should try it because sometimes the palate reveals unknown pleasures! Balsamic vinegar of Modena : IGP proceeds according to the regulations (Protected Geographical Indication) with cooked must and wine vinegar in percentages cannot be indicated on labels. 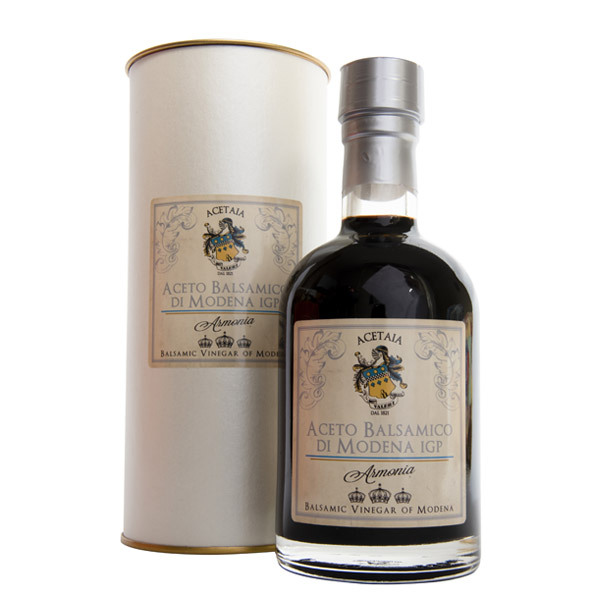 On the main label should be shown only, In addition to the logo, "Balsamic vinegar of Modena” and anything else that might induce the trader manipulated interpretations.